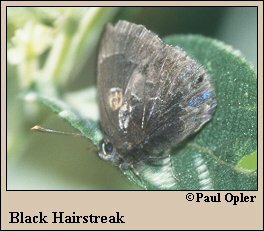 Identification: Upper surface charcoal black to charcoal gray with narrow blue edging on hindwing. Flight: One flight in South Texas in early November; throughout the year in Central America. Caterpillar Hosts: Flowers of Paullinia in Brazil; live oak in Costa Rica. Habitat: Disturbed tropical sites at low to moderate elevations. Range: Argentina north to Mexico. One stray recorded in South Texas.